Welcome to the Curtain Fabric Store where we specialise in Cut Length Designer Curtain Fabrics by the Metre at great prices, we also offer a full Made to Measure Curtains & Roman Blinds Service. Our Fabric Store offers a full range of Made to Measure Curtains available in a variety of headers and linings that can be made to your exact specifications. You can also check out our Surplus Stocks for further discounted materials. The curtain fabric store currently has the largest selection of curtain fabrics online, with over 60,000 curtain fabrics online. 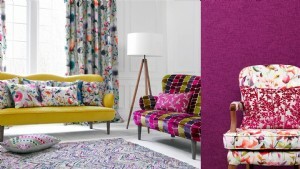 From the Curtain Fabric Store Website you will be able to choose from over 60,000 Curtain Fabrics all from the leading manufactures in the UK including Companies such as Ashley Wilde, Bill Beaumont,Fryetts Fabrics, iLiv, Style Furnishings and Prestigious Textiles and many more. Simply use the options on the site to filter the style and colour of the fabrics you require. Made to Measure Curtains and Roman Blind ranges are all UK manufactured to the highest standard and can be customised to your own requirements. We only deal with the very best manufactures. You can choose your Curtain Headings from Eyelet, Pencil Pleat, Tab Top & Pinch Pleat Headers plus you can choose your linings from sateen linings to the blackout linings You can also add Tie Backs & Cushion Covers to complete all your rooms. 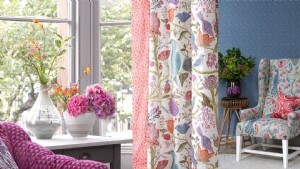 When ordering a Made to Measure Curtain or Roman Blind you can ask the staff at Curtain Fabric Store for full advice. From time to time curtain fabric store will offer great value curtain material for those that are looking for a great bargain. Within our website we have a Surplus Stock Page where you will be able to find large saving on stocked fabrics. These can be short rolls of fabric to large rolls of fabrics. You will also be able to find a great selection of Roll End Fabrics which are mainly from top brands and can be up to or over 40% Off. We would also like to state that none of our fabrics are seconds and are all sold as perfects. If we do sell any seconds fabrics we will clearly state that within the fabric page. We offer a great selection of Curtain Linings which again are at a great price. There are many linings that can be found such as Standard Lining, Poly-cotton Lining, Sateen Lining, Sateen Twill, Thermal Lining, Blackout Lining, Interlining and Bump, if we ain't got it, then ask us to see if we can get it.